Red Nose Day! 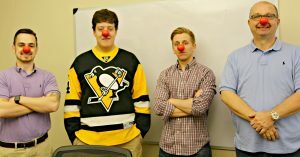 It’s a day of acting silly, sharing some laughs, and of course wearing the infamous red nose. Comic Relief’s Red Nose Day happens to be today–May 26, 2016. ‘Tis the moment to spread awareness and to support some really great causes. The campaign’s slogan says it all ­– “Laugh. Give. Save a kid.” According to the National Center for Children in Poverty, “More than 16 million children in the United States- 22 percent of all children- live in families with income below the federal poverty level. That’s just the U.S. alone; Comic Relief’s Red Nose Day contributions also help children in the poorest communities in Latin America, Asia, and Africa. All of the money raised supports projects that ensure kids are safe, healthy, and educated. Red Nose Day is a monolithic biennial event that has been very effective at using comedy to raise money. Since its inception in 1988, it has raised over $650 million, with $108 million being raised at its most recent event alone. Who’s involved? Some of the world’s top charitable organizations, that’s who! Boys & Girls Clubs of America, Covenant House, Feeding America, and The Global Fund are just a few of the organizations involved. 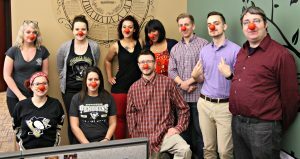 ABG Capital staff members raised awareness today by stopping by their local Walgreen’s and purchasing plenty of Red Noses for employees to wear around the office…and of course they had as much fun as they could while wearing them throughout the day! So why is comedy the remedy for acquiring donors? The Comic Relief Foundation has tapped into a niche of the nonprofit world that really hasn’t been targeted before: humor. Laughing and being silly is working for the organization quite well. Everyone knows the old proverb “laughter is the best medicine”, but there’s a lot more power to humor than its medicinal qualities. Tickling people’s funny bones is also a great way to capture and maintain attention. Something Red Nose Day is accomplishing effectively, especially when partnering with a network as sizable as NBC. Charitable organizations can use humor to help raise awareness, gain partners, and raise funding. Of course nonprofits should be mindful with regard to how they use humor; no one wants to be in the position of offending someone or making light of human suffering. Comedy can be memorable and doing it the right way for the right reasons can indeed boost awareness and even more money. If it captures your attention, it’s already done its job. 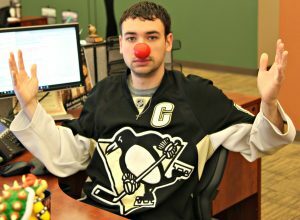 Have fun today–Throw on your #rednose and red flair and do your part for this year’s #RedNoseDay! Also, tune into NBC tonight at 9/8c for the Red Nose live TV special and have some laughs. Happiness goes a very long way, and could be the cure. Are you participating in Red Nose Day? How so?